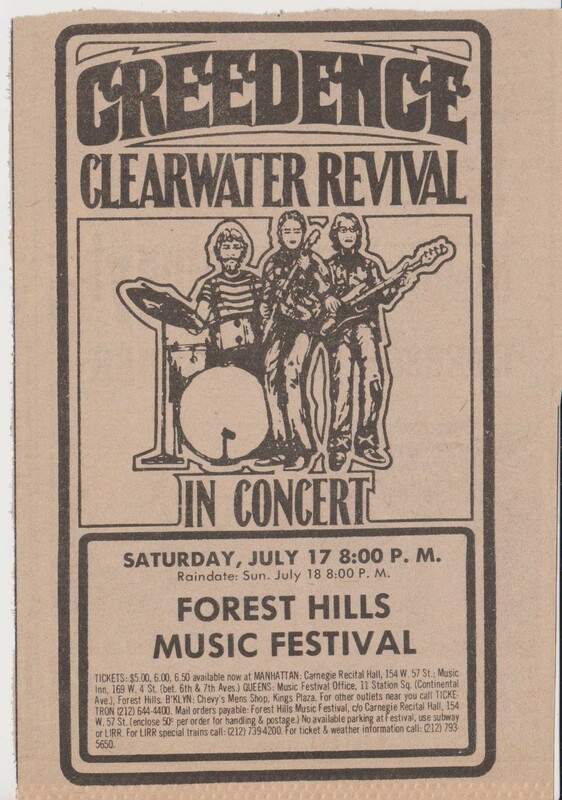 In 1971 on a hot summer’s Saturday night in July, I heard on the radio that tickets were still available for the Creedence Clearwater Revival concert at the Forest Hills Stadium. I begged my mother for the money and to let me go, I was 15 years old and I was about to go to my first concert ever! 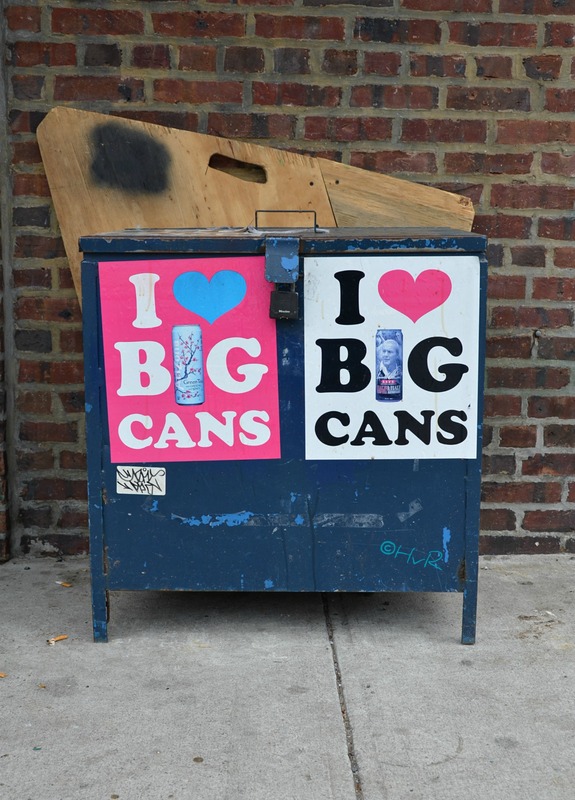 I put on my size 28 faded pink with blue patch pocket bell bottoms and my purple long sleeve butterfly t-shirt and ran to the subway to head up to Forest Hills. My seats were waaaaay in the back of the oval of the stadium, but I was so thrilled, I didn’t care. This was the group that had performed between The Grateful Dead and Janis Joplin at the legendary 1969 Woodstock festival. My music tastes were still evolving, I hadn’t quite found my identity. Disco was yet to come, then I loved the bluesy rhythmic rock style of Creedence Clearwater Revival. Their albums were all the rage in school and on the radio, I had all their lps and 45s. I loved the imaginative magical hit ’doo doo doo’ “Lookin’ Out My Back Door” from their 1970 Cosmos album. I have never forgotten sitting way up their in the upper seats singing along and experiencing what was to be so many more incredible concerts in my lifetime. I remember I was such a goody two-shoes that when the audience rushed the stage half way through the concert, I stayed in my assigned seat – boy did I change! Within the next few years to follow, my musical tastes varied and broadened to include incredible concerts by The Rolling Stones, Sonny and Cher, any Beatle, Elvis at Madison Square Garden, Rock & Roll Revivals, and Elton John. Eventually my taste for disco and the fever to dance ruled and I forsook the sounds of rock, but never completely, always appreciating a good rock artist. 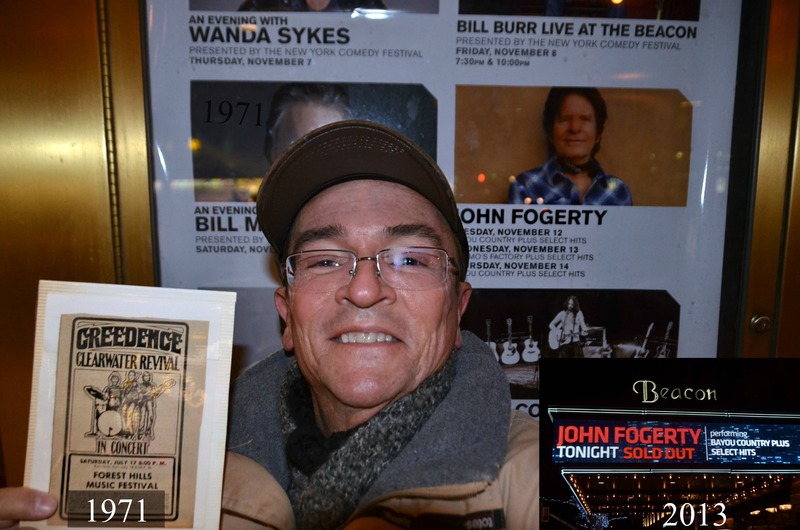 Forty two years later, I saw an announcement on my friend Randi Horowitz’s web site SocialEyesNYC.com that the surviving and founding member of Creedence Clearwater Revival, John Fogerty, was going to appear at New York’s legendary Beacon Theater. I had to go! 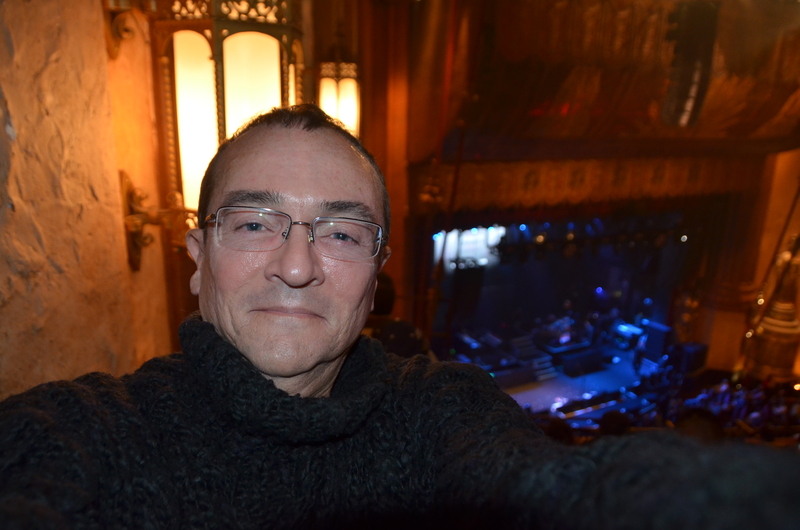 Ironically, the only tickets that were to be had were in the upper balcony, again, but didn’t mind – I was going to relive my first concert of forty two years ago. 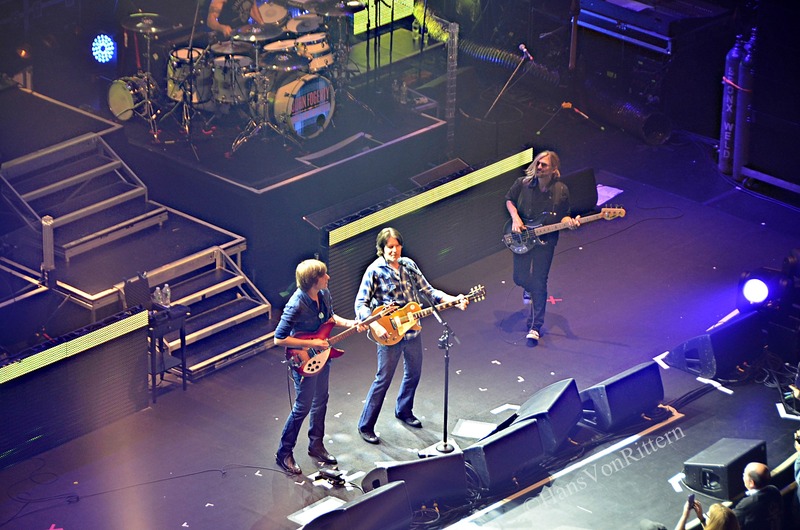 John Fogerty, an energetic and vibrant 68, gave his all and totally rocked the house with his electric guitar for 2-½ hours. Hit after hit after hit. I had come home again, and so had the rest of the audience. The audience all seemed to be from Queens, Staten Island or Westchester. The faces seemed sort of familiar yet things had changed dramatically. 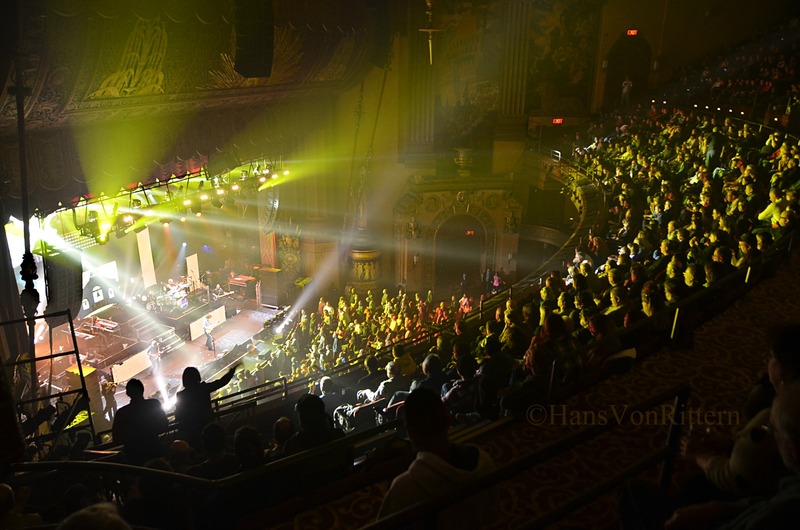 See my following post of “observations of a concert crowd 42 years later”.